Increased protection against earthquake damage; improved safety; complete upgrade of electrical and lighting systems to comply with latest codes; adherence to strict historical preservation standards; reduced energy costs; protection of public investments; efficient project management and change order administration; LEED Gold certification; on-budget completion nearly two months ahead of schedule. To improve a critical municipal building's ability to withstand earthquakes; bring the facility's electrical systems up to code; maintain the building's historic character; meet U.S. Green Building Council energy and environmental standards. Dynalectric helped this client achieve its objectives by combining electrical contracting expertise and knowledge of today's increasingly demanding energy requirements with sensitivity to this facility's designation as a Cultural Heritage Landmark and its inclusion on the National Register of Historic Places. In the process we had to overcome several significant challenges. First, after a new foundation and earthquake-resistant isolators had been put in place beneath the building, Dynalectric had to install a 2,000-ampere bus duct in the three-foot isolator space. Since the duct was too heavy to lift by hand, we made innovative use of its equipment to get the job done. Second, Dynalectric installed all related conduit, wire, and lighting while removing the facility's antiquated electrical systems and putting in new electrical rooms, panels, connections and disconnects, outlets, switches, interlocks, overload protection, and circuit breakers. Third, since this was a historical restoration, servicing the facility's lighting fixtures posed a special challenge. Following special procedures we developed for the project, Dynalectric crews identified, photographed, removed, and carefully packed each of the building's historic fixtures. These were sent to a Dynalectric vendor for restoration before being reinstalled in their original locations. Finally, in the City Council Chambers, the company oversaw installation of state-of-the art cameras, monitors, and other audio-visual equipment, providing a highly modern environment in this very important historical setting. All of this work was completed approximately two months ahead of time. Furthermore, while accelerating the project increased change orders by 20 percent, the project itself remained under budget throughout. Other information: Because of Pasadena's commitment to environmental sustainability, the City Council required that the renovated building earn base-level certification in the U.S. Green Building Council's Leadership in Energy and Environmental Design (LEED) program. When the building re-opened, however, it qualified for LEED Gold certification, a particularly noteworthy achievement for a structure more than 80 years old. Up in the building's dome, the company worked with lighting specialists and a building mock-up to determine where lights should be placed to best illuminate the building at night while also enabling easy access for maintenance. Dynalectric then installed the fixtures for attractive presentation by keeping conduit feeds out of sight to those viewing the building from below. When they undertook to build a new city hall in 1927, Pasadena municipal officials set out to create "an official building of imposing beauty, massive yet graceful, and suited to a land of flowers and sunshine." The grand building that resulted immediately became - and still is - one of the country's most distinctive public spaces. 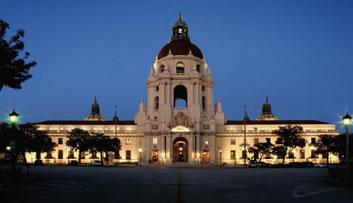 Beneath its graceful six-story central dome, the building, which contains more than 200 rooms and 132,500 square feet of usable space, is a prominent feature of the Pasadena Civic Center. Clark Construction Group California L.P.